Exercise? President Trump says he gets plenty of it—but you likely won’t see him in a gym anytime soon. 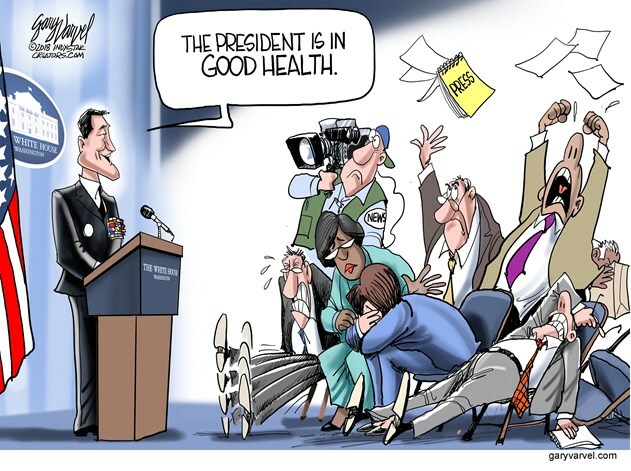 The conversation comes after White House physician Dr. Ronny Jackson told reporters President Trump was in excellent health, but he could stand to lose a little weight, eat better and get more exercise. Trump, who has an affinity for fast food, said he’d be willing to work on the food aspect. “I’ve always been more of a believer in diet ‘cause I‘m strong, you know? I hit the ball far. I mean, I‘m strong, physically,” he said. Trump, at 6 feet 3 inches tall, weighs 239 pounds. Jackson said he could stand to lose 10-15 pounds. But he probably won’t be hitting the gym. “A lot of people go to the gym and they’ll work out for two hours and all. I’ve seen people ... then they get their new knees when they’re 55 years old and they get their new hips and they do all those things. I don’t have those problems,” Trump said. Jackson confirmed that the president is "absolutely...fit for duty." "I think he will remain fit for duty for the remainder of this term and even the remainder of another term if he is elected," he told reporters Tuesday.